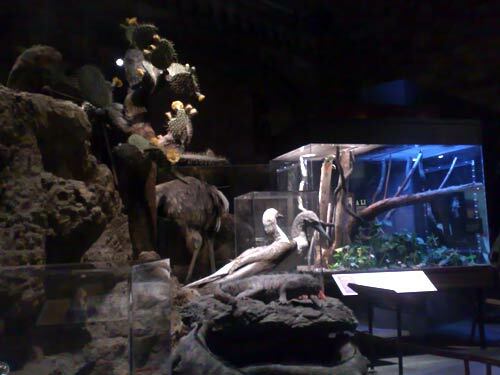 In the run up to Christmas, I took some time out to go to the "Darwin: Big idea, big exhibition" show at the Natural History Museum in London. I was very impressed with it, and came away having learnt quite a few new things about both Charles Darwin the man, and the science behind the theory of evolution. From the human point of view, I hadn't realised that as well as noting in meticulous detail the flora and fauna he encountered during the journey of The Beagle, that Darwin had also eaten a good deal of his exotic finds. At University he had formed a club dedicated to eating animals 'unknown to the human palate', and he made good his word during his journeys. Indeed, apparently one of his 'discoveries', the smaller and rarer species of Rhea, was only made halfway through eating it. The whole trip also nearly never happened. Darwin's father thought it a foolhardy distraction from his son's intended career in the clergy, and the exhibition displayed some of the preserved correspondence between Darwin, his father and his uncle as the pros and cons of the trip were debated. Another part of the exhibition showed Darwin making a pros and cons chart about the prospects of marriage. "Pro: object to be beloved and played with. Better than a dog anyhow"
"This is Charlie. He doesn't mind being here so you can get as close as you like, but please don't tap on the glass"
The exhibition was put together in collaboration with the American Museum of Natural History and museums in Boston and Chicago, and so there were a few Americanisms in it. These slightly jarred in the old Victorian halls of knowledge that make up the Natural History Museum. 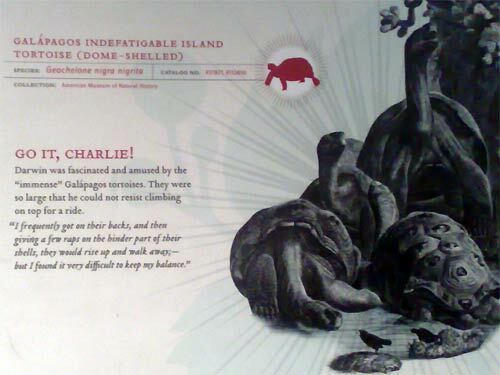 In one panel Charles Darwin wondered how animals had "gotten" that way, and another panel, about Darwin riding on the backs of the Galápagos Tortoises was headlined "Go it, Charlie!". I was slightly concerned that I would find information that the glyptodont was an embiggened armadillo. "Certain expressions of creationism - for example, the view known as intelligent design - hold that Darwinian evolution is not sufficient to explain the origin of complex structures, such as the eye, or complex organisms, such as humans. They assert that such innovations must be the act of an intelligent designer. Creationism, including intelligent design, does not offer a scientific alternative to the theory of evolution"
There was one final example of evolution on display - well, an example of evolution in the online world anyway. 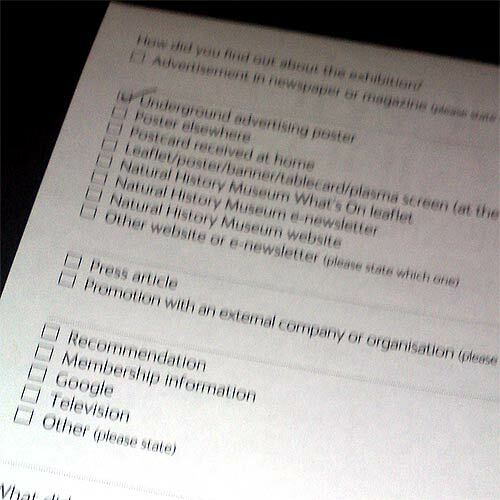 The comment sheet asked you to state where you had first heard about the exhibition. One of the options was 'Google'. Not 'Search engines' in general, just 'Google'. Survival of the fittest indeed. By Martin Belam on 28 December 2008. Thanks for the review! I hope the exhibition will land on this side of the pond as well. I also enjoyed the un-apologetic view of Creationism and it's little brother, Intelligent Design. It's not scientific, so let's just say it rather than tip-toe around peoples sensitivities!